[Bassam] started off by taking apart a disposable camera for the flash bulb and capacitor. After that, a circuit was designed that picks up a signal from a microphone, compares that to a preset threshold, and then uses a 555 timer to trigger the flash. The shutter of a DSLR can be left open in a dark room, so all that is needed to capture a moment in time is the snap of a finger. [Bassam] also posted gallery with the fruits of his labors. 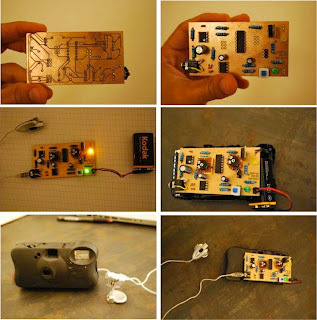 Although this isn’t the first time we’ve seen a high-speed camera hack, the simplicity of [Bassam]’s build is impressive. He designed a single sided board for his circuit, and the parts are very common so it should be an inexpensive build. “but the cameras and necessary and necessary equipment is a bit out of reach for a hobbyist.? You can expect to pay £10,000+ (usually a lot more) for a half decent high speed camera. Just hiring the Phantom HD will set you back about $2000 a day. http://z-p-t.pl/2011/07/29/zdjecia-w-ulamku-sekundy-wyzwalanie-dzwiekiem/ Similiar project with photos and some analysis. Nice project, I like how it uses cheap off-the-shelf universal (internationally available too) parts. Amazing project! Simple and genius! How can we purchase it?